Our festival programs continued successfully in the Sydney area. After performing there for two weeks, we flew to Melbourne for a three-day program in the prestigious, centrally located town hall auditorium. When we arrived to begin setting up early one morning the devotees were awestruck by the ornate architecture, spacious rooms, high ceilings and crystal chandeliers. “We’ve never performed in a place like this,” one devotee exclaimed. That night the hall’s 400 seats were filled long before the festival began. We had to turn people away at the door. Inspired by the impressive surroundings and enthusiastic crowd the devotees performed exceptionally well, as evidenced by the loud applause they received after each performance. But from time to time we could hear a small group of people laughing and joking. It wasn’t enough to cause a major disturbance, but I could see some devotees were distracted during their performances. During my lecture I lost my train of thought twice when the group started laughing. Because the hall was large and dimly lit during the show, it was difficult to pinpoint from where the disruption was coming. After some time, however, the disruptions stopped. “I sure did,” I replied. “What’s so funny?” I said. “It was a group of people who brought one of their friends as a joke. It was her birthday and they didn’t tell her where they were taking her. After Melbourne we returned to Sydney for several days of harinama leading up to New Year’s Eve. But the weather was terrible. It rained every day. When it came time to leave for the east the devotees were relieved. They’d heard about the semi-tropical weather in Queensland and northern New South Wales. On the way to the airport I asked the driver to turn on the radio so I could listen to the national weather report. I was shocked when I learned that a cyclone was passing near Queensland causing unprecedented rain and wind for the time of year. Sure enough, as our flight from Sydney proceeded northeast we were soon greeted by ominous dark clouds. Strong winds shook the plane violently as we landed in Coolangatta. The rain poured as we drove from the airport to our new base, the New Govardhana community. “How will we do harinama in this rain and advertise our festivals?” I asked the devotee who had come to pick us up. To get to New Govardhana, we had to cross a bridge over a small river. When we arrived I was shocked to see the fast-flowing river only a few centimeters below the bridge. As our group of seventeen devotees settled into their accommodation that evening, the rain continued incessantly. Because of the force of the storm I woke up three times during the night. Despite the inconvenience caused by the weather, we were determined to push ahead with our first festival in Byron Bay. After breakfast we got into a hired bus and drove down to the river. The water was already flowing freely over the bridge. The driver looked at me as we poised on the edge of the river. “What do you want to do?” he asked. he listened. He then hung up and turned to face us. When we reached Byron Bay the rain had still not let up. I looked out the bus window and saw that despite the bad weather a few people were still shopping and taking shelter under the eaves protruding from the roof of the shops whenever there was a downpour. Devotees quickly gathered the drums, karatalas, banners and invitations. Jumping out into the rain, they made their way to the protected areas on the sidewalk. The short journey from the bus to the covered area left them completely soaked. “Bad move,” I said to myself. We chanted for twenty minutes, but fearing that everyone would get sick I ordered the devotees back in the bus. 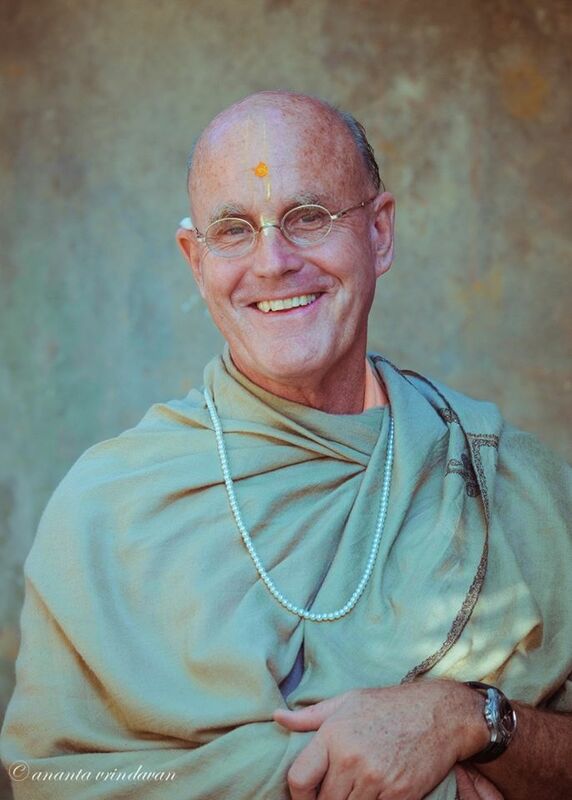 “How many invitations did we do?” I asked Santi Parayana dasa. On the way back to New Govardhana, a devotee received a call from the SES that the bridge to our property was submerged under two meters of water. “Give Ajita a call,” I said. Half an hour later Ajita called back. We packed as many women as possible into one of the cars accompanying us, and the rest of us rolled up our dhotis and saris and sloshed through the mud and driving rain for more than an hour to get to the farm. By the time we arrived we were completely soaked and utterly exhausted. “Maybe tomorrow will be better weather!” Santi Parayana shot back. The next morning I woke up early and immediately went down to the river. Although it was still dark I could see the waters were still rising. An hour later Ajita showed up in a four-wheel drive jeep. James’s property in the jeeps, boarded the bus and headed for Byron Bay, driving at a snails pace through the storm. After all we’d been through a couple of devotees became despondent. for the rain to ease. We waited and waited. Taking a cloth, I wiped the bus window and looked outside. Within moments, we were moving down the street chanting and dancing with abandon, taking advantage of every dry moment. We all knew it was only a short respite in the storm, so we gave it all we had. The people of the town also took advantage of the break in the weather and came out in huge numbers. The deserted streets were suddenly full of people. I don’t think any sankirtan party in the history of ISKCON distributed so many invitations in such a short time. In exactly sixty minutes we covered the entire downtown area twice. And just as we gave out the last invitation, as if on cue the thunder clapped and the lightening streaked across the sky. As the rain came pouring down, everyone – shoppers and devotees alike – ran for cover. A few minutes later we were back in our bus soaking wet, but ecstatic. “Well done prabhus!” I said. When we arrived at the festival hall, I held a short meeting. In retrospect, I think the Lord wanted to reciprocate with the austerities those devotees underwent. That night 460 guests flooded into the hall when we opened the doors as the festival began. It was one of our best shows ever. Afterwards, people thanked us profusely as they stepped back into the pouring rain. But the happiest of all were the devotees. “It was worth every minute in the rain,” said Santi Parayana with a smile. We were able to drive to Murwillumbah, the town closest to the farm, but no further. “Tirtharaj dasa has gone to inquire from one of the motels if there are any rooms free,” I said. “But all the hotels and motels have been vacated for flood relief victims,” said Santi Parayana. “We could try the next town over,” I said. “Thousands of people have been stranded by some of the worst flooding eastern Australia has seen in twenty years. Entire towns in Queensland and northern New South Wales have been cut off, while rising flood waters have forced hundreds to leave their homes. A map showed that the hardest hit area was around Murwillumbah. Early the next morning, the radio news report told us that the federal government had declared the entire region a natural disaster area. And more bad weather was on the way. Despite their grim predicament, the devotees were in a light mood. We had beaten all odds and had a successful festival. Although we were in a disaster zone, it felt more like an adventure to write home about. When I told the devotees about the cows, everyone became silent. One of the ladies started to cry. The devotees looked at him in disbelief. “I just heard an update on the local news,” said another devotee. “They say the flood will recede for a couple of hours at low tide around 5pm. It may be possible to drive out of town at that time via the northern exit. I called Ajit and asked if he could pack up our things, put them in the jeeps and drive through the floodwaters to our hotel. “If the water’s not too high,” he replied. By that time it was 9am, and everyone was hungry. One of the men offered to go to the nearby convenience store and buy some fruit and nuts. Suddenly Tirtharaj’s cell phone rang. It was a local Indian family who lived not far from the motel. They were inviting us for lunch. A big cheer came up from the devotees. While we were taking prasadam a few hours later, Ajita ar-rived at the house with the jeeps. There was no need to say more. Within ten minutes every-one was in the bus, ready to go. All of them slept the three hours to Brisbane. I didn’t bother waking them, knowing they needed the rest. The next day they’d be back on the street for three hours of harinama, and the day after that there would be another festival. So try to spread this Krsna consciousness movement. This is your sadhana , execution of austerity, penance. You have to meet so many opposing elements. That is tapasya. You are tolerating so much botheration and so much inconvenience, personal discomfort; everything sacrificed. But it will not go in vain. Rest assured. It will not go in vain. Krsna will, I mean to say, reward you sufficiently. You go on executing this Krsna consciousness.